I bought one of these back in Sep 2018. It fits well, is smooth to the touch in use, very clear and doesn't interfere with using the phone BUT it has one increasingly irritating drawback... The design allows DUST to get under the protector glass. To start with it's barely noticeable but as time goes by more and more dust gets underneath. I now have an area around 60 x 25 mm in the top right corner which has a cloud of dust specks. The design uses microdots of adhesive which leaves a small air-gap between it and the screen. This prevents both optical fringing effects and slightly cushions the effect of an impact, but because the edge of the protector doesn't have a bead of adhesive around it to seal it, it allows dust to get into the air-gap. If you keep your phone in your pocket like I do then fabric dust gets under the protector glass. The only way to remove it would be to remove the protector and clean it. Even if it could be done without breaking it, the chances of being able to be re-fit it and it still staying firmly in place are small. It's a pity as this issue spoils an otherwise great product and I've reduced my rating from 5* to 3* as a consequence. I've bought this twice now. The first time round I was un impressed as I had cracks and chips around the edges after the first day of putting it on even though I had never dropped or bashed the phone. But the real test came when I dropped it face down on our drive the other day and it cracked it very badly so I had to buy a new one to put on. It has done the job because my screen underneath is completely fine and not cracked or scratched so I've bought another one. I'm interested to see if this one cracks around the edges very quickly too or if it was just a dud the first time round. It came fast and was super easy to fit with great products to assist in the installation process. Easy to install, and true description of produce in ads. The glass is pretty nice and fits well. After a few days of use i found out some falls of the product. - from time to time it will look like water or oil is underneath the screen making slightly colourful and weird patterns. It responds to the touch (changing shape) but it barely noticeable when the screen is on. Overall the negative aspects of this product arent very noticable through daily use but I would not come back for the same product again. I wanted to know if you have what I looked for and I've found it then ordered straight away. The item was in perfect condition, with a secure case and all the necessary items to use it. Delivery was quick, I definitely will order from this shop in the future. Excellent product, with one downside.. I bought 2 of these protectors. There seemed to be a residue behind the screen guard. Assuming I had incorrectly installed the first one, I removed it and installed the second one. The problem however persisted. It was only afterwards that I read that these protectors are slightly curved. It is this design flaw which creates a minute air gap between the protector and the phone screen. This air gap causes refraction of light leading to a rainbow-like oily haze under the screen guard, centered in the middle of the screen. This residue by no means diminishes the protection. But, everytime I unlock my phone , I find my attention drawn to this flaw. This is my 3rd one, since September, I have now given up buying them as the last one only made it 28 hrs. they are too brittle around the edge and i think this is due to not fitting the phone properly. I hate the cheap plastic ones as they never fit without a single bubble, but this is just not worth the money as it cracks to easily. Does what it says on the tin. Easy to apply and has given me the peace of mind knowing my p20 Pro screen is protected. Perfect fit, solidly put together package with all accessories to ensure clean fit. Wanted a screen protector which was more sturdy / helped keep screen clean than that that was given at time of purchase.Order was easy to place, quickly completed and very satisfied with product purchased.Thank you! Bought this screen protector from Mobilefun.i buy all my phone accessories from this company.always have great service prompt delivery.and will continue to use this company in the future.the glass screen protector was so easy to fit and can see it will do the job . It was very easy to attach to the phone, no bubbles to get rid of???? I would recommend this. The screen protector is only effective when you apply it Upside Down! The small camera gap at the top actually ends up covering the camera lens! Also let's in dust on the sides. Otherwise it is fit for purpose.. Very strong and good value for money. This screen protector didn't even last two weeks. At first it looked great, and was easy to put on. Aside from the rainbow glare in the middle, I was happy with it. Then one day I noticed that there was a crack on the bottom side of it. I thought, perhaps, it was me, but I haven't dropped my phone at all since I've gotten it. The material is just thin and cheap. I guess you get what you pay for...10 quid down the drain. I switched to it because my previous screen cracked in 5 days. Looks like a good product but it never stuck to screen. Started lifting off screen in 1 day. Not enough glue...might be a one off but I've got to look for another. This is the 3rd Screen protector that I have had to buy because I dropped the phone and the screen was protected by the screen protector cracking. It was a big challenge to find the perfect screen protector to my Huawei P20 Pro. After a few YouTube videos I decided to buy Olixar Screen protector and I'm very happy ????. Olixar screen protector fits in 100% and very easy to install without bubbles. I can recommend in 100 % to everyone who has huawei p20 pro. Thank you mobilefun for fast dispatch and high quality service. Good quality, crystal-clear and fits well. Doesn't interfere with any of the 3 cases I've tried (standard Huawei gel case, Olixar gel case, Olixar MeshTex case). Allows smooth finger swipe action and finger marks wipe away very easily. Fitting tip: The hole in the black mask for the notification light is very small and requires very accurate alignment. You can make this easier by plugging the phone into a charger to illuminate the light which makes it easier to position the protector correctly. Tip 2: It shouldn't be necessary, but if you find the protector reduces the touch sensitivity, go into the settings and turn 'Gloves Mode' on. This increases the distance over which the screen will register a touch. Tip 3: At least one reviewer mentioned the matrix of tiny dots visible under the screen. These are to assist fitting (they prevent immediate full adhesion allowing some re-positioning). When you are happy with the positioning, make sure that you smooth out the screen by pressing firmly (but NOT hard) across the whole screen area several times. Over the next few days you will then find that the matrix of dots then all but disappears completely. Make sure you stick it on the right way round. I made the mistake with the first one I bought. Great service but very poor product chipped within a day. More chips appeared two day later. In the bin now. I've have the screen protector for about 2 months now and it's all scratched and has a large crack along the bottom. This is the second product I have purchased from here, that has had problems and it will be my last. Sorry to hear you are not happy with this screen protector. If the screen protector has scratches on it and a crack, hopefully it is doing its job and preventing this from happening to your phone's display. If you require any assistance, please contact our Customer Services team. Perfect glass for P20 Pro, Incompatible with Case! After buying a P20Pro, I knew that keeping my phone protected was essential to a long life and a the biggest part of that is screen protection. I bought this product alongside 'camera tempered glass' to look after the 3 cameras on the back, and a SPIGEN ARMOUR CASE. After following the guideline set out online and on Olixar's packaging I correctly assembled the glass to the phone and placed on my phone case.. Protected? Not quite.. Upon pressing one of the side buttons, the glass lifts off the case, rendering the sensitive touch screen useless and now the screen protector can lift with ease. Thinking this was my fault, I went and ordered another (£15) and the same thing happened again! I complained about this and Mobile Fun were very helpful. They couldn't refund me, but they sent out another screen protector, which was definitely a good thing to do as I was going elsewhere for good. Sadly, even after leaving it for 9+ hours for the tempered glass to set as best it could, the same thing has happened and so my armoured case by Spigen is completely useless and thus a waste of money whilst using this screen protector. This Screen Protector was 'highly recommended' for my phone. DON'T BUY IT, if you plan on using the sleek armour Spigen case, you will be severely disappointed. I will now buy another case, in hopes this doesn't happen again, if it does, I'll change this review from 3* to 1*. This is a very poor product. I bought two. I followed the video to fit the first one. It seemed OK for a while, although you really had to push the buttons to get a response. Two days later it fell off. I attached the second one following the video again as I assumed I had made a mistake. Again the performance of the phone deteriorated and the cover came off after a week. Don't buy!! Looked like a good option but quite quickly cracked. I have never dropped the phone but it got a visible crack in top corner. So it turns out to be cheap rubbish. Do not buy! Good Quality product but BEWARE! Installation is very tricky, make sure glass of phone is crystal-clear and sparkly clean and work in a well lite and dust-free area before installing and be sure to accurately position glass to phone before applying or you will regret it! I spoiled my installation and had to scrap my piece and at 24$ it was an expensive lesson to learn! Not good enough or worth the money. Looks good and fits the device well. Unlike glass protectors I've used for other phones, the p20 pro protector only sticks to the screen around the edge and not all over the screen. Dust builds up quickly and eventually, in a couple of weeks or so causes the protector to lose its stickiness. This has happened on three protectors I've fitted. The first place this build up happens is around the notch, the top of the notch is the adisives weakest point. 3 cracks in first week ! The first crack appeared in the first 24hours, right at the edge of the screen protector. I put this down to the fact that may be I hadn't fitted it perfectly, but in a couple of days a 2nd one happened, then a 3rd. The phone has never been dropped and all these occurred when it was in my pocket. Never again. Seems like it will kinda do the job, but keeps popping up one side, so have had to temporarily stick down with tape untill new on comes. Fits perfectly very easy to fit, no bubbles or gaps. No problems at all. My first purchase had the old style screen protector which unfortunately came unstuck after trying to fit a Spigen rugged armour case to my phone, the replacement has a much better fit and is identical to the photo, I especially like the cut out on the finger print scanner, it makes it much easier to press. This works well with the olixar leather flip case. Do not buy, this is flimsy and not good at all, dropped my phone and the screen protector cam off!! The tempered screen protector in the first week started to let dust past then it started to come unstuck . I had to remove it all together has I was worried that it would let dust/ dirt bye and scratch the glass,so know I have lost money and not to happy with this product. 2nd screen - so far so good. The first Olixar screen protector unfortunately started to lift from the screen and when I tried to gently press it back onto the phone it cracked. Mobile Fun were good enough to send a replacement which like the first one went onto the phone with very little difficulty but unlike the first one has remained firmly attached to the screen and, fingers crossed, it is so far so good. 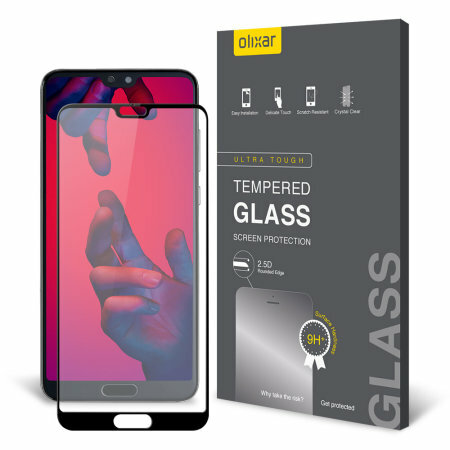 The Olixar Glass Screen Protector fits my phone perfectly and the performance and look of the phone is in no way compromised; it looks and feels excellent. Long may it last! It fits well amd its a lot better then the normal one supplied by huawei on the phone. No issues as of yet with it. Looked well built but was a complete waste of money. I followed all the instructions and applied the product without any bubbles but had a rainbow effect at the center of the screen. Also at times the responsiveness was not great. I ended up taking the protector off as it was really bothersome. Maybe it was a bad batch but not going for this product again. I must say before: Fits perfectly (the only one so far, from my experience that is why the 4 star). I follow the instructions, did exactly as told and the protector was place really good and firm. But after few day (not even a week), the protector started to show bobbles of air, and start to fall apart. The top draw i find it really hard to pull down with protector, the corners of the phone are almost impossible to press with protector. Now i don't know why, but i won't judge, but the price and the result are bit high and costly (for the days that the protector survive). I bought 2 of this protector just to try, hope the second one will work better. Very easy to fix to the screen and fitted perfectly with no imperfections as you'd expect with a quality glass protector. Touch screen and fingerprint reader work flawlessly and marks are easy to remove. The screen protector is supplied with some cleaning wipes but if you keep the plastic screen protector supplied with the 'phone on until you replace it the surface doesn't need any preparation. Followed instructions to the letter and have put on countless screen protectors before for our company phones but this is the first I've had trouble with. It left an 'oil spill' look on the screen which was visible even when the screen was on. It also scratched very easily and had two scratches to it within a few days. This is something I've never experienced before with a screen protector. It then shattered when the phone was knocked which I appreciate is what it's designed to do but the shards left when it was removed were very sharp and splintered my hand. The screen cover did its job and shattered on a drop, a very small drop from sofa to floor a day after putting it on my phone. The cover didn’t completely cover my phone. I’m giving it two stars because it cracked rather than my phone but I hope it would’ve lasted longer and not be destroyed by such a small drop. An accurate fit with no affect on the visual quality of the screen and delivered quickly once the product became available. Recommended. A great product, went on easy and fitted perfectly. I'll start with the positive. As always with Olixar products this is a really high quality screen protector. High standards, durable and beautifully packaged. You can be certain that this will arrive safe and not damaged! There are a couple of downsides that mean I won't buy this again - but they're personal preferences. First is the notch. This screen protector covers it completely so you will have to turn it off in our display settings. To me, it's a shame as I was loving the look of the notch. Also, if you don't fit the protector perfectly you will see some icons from the notch poking through. The second negative from me is how it makes the fingerprint scanner difficult to use. It makes it slightly more difficult to recognise your print as it's now partially "recessed". Whereas without the protector on, the fingerprint sensor is flush with the screen. If you can look past these negatives then I'd recommend it. I personally won't buy one again but I can't knock the build quality! Purchased this for my P20 Pro... It is the best fitting tempered glass I have purchased for any of my phones. Like all tempered glass' it is very easy to apply. Many of the same products claim 'no bubbles guaranteed' and I never take any notice of this but I had absolutely no bubbles when applying this to my phone.